The Retro Kitchen – Kitching your Kitchen! The vintage trend has been popular for quite some time now and this is mostly a style that takes inspiration from the 40s and 50s. Well, there is a new trend in town and frankly we’ve moved on – get ready for the retro kitchen – kitchen spaces with the colour, pattern and overt confidence of the 1970s and 80s! This period was mainly known for garish pattern and loud clashing colour and many kitchens in this era would have featured a whole lot of melamine, plastic and linoleum. A retro kitchen for the 20-teens however is a little more understated than that and is all about the accessorising. A retro kitchen will make a real statement but you need to keep your options open should fashion and tastes change in the next few years. We advise a minimalist, modern style kitchens that can be used as a blank canvas – our Gloss, Cologne or Lucido kitchens would work well. You can then add various retro elements to create a retro look. You can get some fantastic retro patterned tiles that can be used as a funky splashback or as flooring (or both if you’re feeling bold!). Go for a washed out toned 70s floral pattern or a brightly coloured geometric 80s tile such as these. Just like with tiles, you can now get a wide range of retro reproduction wallpapers. It might be too much on all walls so perhaps create one feature wall and then pick out a more neutral colour from it for the remaining walls. If you are not quite ready for the tiles and wallpapers you can still nod to the era with a retro blind or even just tea towels (why not frame them and have a range on the wall as art?). Table linen and/or seat covers can create a fantastic retro accent. Those of us of a certain age will certainly remember the Tupperware, the Hornsea Pottery canisters and patterned mixing bowls, pots and pans. You can still buy original items or modern reproductions that can be displayed on open shelving. If you have a big enough space it can work well to combine your fitted kitchen with some free standing items of furniture and of course a dining kitchen will include a table. Tables, chairs, shelf units, sideboards and dressers can all be sourced with a retro vibe and you can also add light fittings, clocks and retro mirrors to complete the look. Chances are, you think of a 70s or 80s kitchen as having all of these elements and that is the difference between the original kitchens and the retro trend now. We have, believe it or not, learned a few lessons about less being more and the value of understatement. You can create a modern retro style (if that is not a contradiction in terms!) by just taking some of these elements (not all of them!) to create a retro scheme that still has the benefit of a modern, streamlined neutral kitchen with accents of kitch to create a contemporary kitchen trend. Plus of course, your ‘blank canvas’ kitchen can be adapted in a few years to create the next look when you want to strip away the colour and go for understated Scandi chic, or whatever the latest kitchen design trend is! 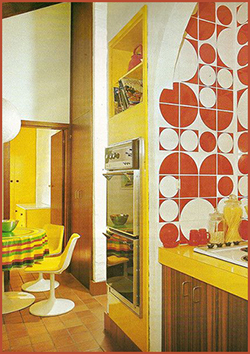 You can see all of the images used here and many more on our Retro Kitchens Pinterest board*. If we can help you create your retro kitchen then please get in touch and let’s start being creative! * See Pinterest board for full credit for all images. 0 Responses to "Kitchen Monthly Trends Blog – November"